Thirty years of experience in the industry and an emphasis on customer service are what have made Audrey is one of the most recognized professionals serving Hidalgo County. It's why so much of her business is repeat clientele and referrals from satisfied customers. People simply know that Audrey will always get the job done right. It's the satisfaction of helping her neighbors and friends in a career she loves that pushes Audrey to exceed expectations and deliver nothing but the best to you. 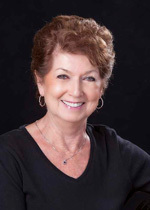 She has practiced real estate in Minnesota since 1978 and Texas since 1982 and has been a broker/owner since 1994. Audrey is committed to client service by combining professional service with integrity, personal attention, follow-up and follow-thru to the last detail. Qualities you will appreciate when you are making, perhaps one of life´s biggest investments. To paraphrase Will Rogers, "Audrey Gardner knows what she is doing; she loves what she is doing and she believes in what she is doing."